It is 4 am in Ntcheu; time to wake up and prepare for those going to work. Winnie Phiri, fondly called Nambewe by her mistress, wakes up at that time to heat water for her boss’ bath. Nambewe is only two-day-old as a maid in this house at Ntcheu Boma. Every household must pay K1,500 at the beginning of every year to draw water from the borehole. Membership fees range from K1,500 to K2,000 and has to be paid at the beginning of each year. At New Lines location, for instance, rules stipulate that a household has to pay K1,500 at the binning of every year and K500 every two months. “The money collected from every household that draws water from this borehole is meant for its maintenance. It was not easy for people to contribute money whenever the borehole got broken down. committee (DEC) took turns in a meeting to accuse the board of failing to timely solve the problem. “Why is it that we have the same problem every year but we do not have a lasting solution to it?” said Social Welfare Officer Mike Makalande. The water challenge has also affected operations at public institutions such as district hospital, prison and council offices among others. “The water problems have resulted in blockage of toilets because the hard stools need enough water to dissolve. “We experience so many blockages because the toilets are used by many people but do not have [enough] water to support the system,” said District Health Officer Dr Mike Chisema. Chisema said the situation at times forces the hospital to take its dirty linen to Neno and Balaka district hospitals for washing, a distance of about 150 and 43 kilometres, respectively. The hospital serves between 700 and 1,000 patients a day and currently relies on the groundwater the borehole produces but is not enough for the institution. “Inmates draw water from 7am to 9 am and from 12pm to 2pm. The rest of the time is allocated to the community around,” Mang’anda says. Ntcheu District Commissioner Smart Gwedemula is also concerned that the situation is not improving at all despite calls to CRWB to improve its service delivery. CRWB Public Relations Manager Zephelino Mitumba attributes the water problem to blockage of water source at Chipusile perpetrated by communities who use it for irrigation farming. 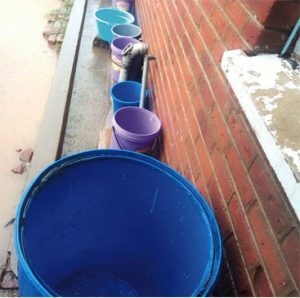 He adds that, courtesy of the current rain season, the board has considerable volume of water coming from Mpamadzi and Maliko streams but some residents still experience shortage because of turbidity.